Home composting is becoming more popular as a way to reduce landfill waste and also creating extremely rich soil and a natural fertilizer. But for many the idea of composting is completely foreign. Some don’t even know what composting is, why they should be doing it and what the benefits of composting are. With growing education around the subject, many more people are likely to join the home composting crew for the benefits that they can gain. Composting is a process in which individuals compile decomposing organic material and it generally is performed using a composting bin or a compost pile in an area away from the main home building. When composting the decomposing organic matter is placed in a pile which breeds heat and while micro-organisms decompose the material in the compost pile the waste becomes an extremely rich form of soil. The rich soil that results from composting is called compost and it is extremely bountiful in nutrients which make it very beneficial for the land on which it is spread. Why composting? Most people utilize the compost that results from their composting efforts as a fertilizer. Compost as a natural fertilizer is very efficient and it allows people to apply fertilizer to their gardens without utilizing many of the poisons that are included in commercial fertilizers. Compost is also a great way to condition existing soil, add natural richness to soil that lacks in nutritional elements, and it also acts as a natural pesticide. Many small farmers and individuals who grow their own food utilize composting as a way to preserve the fruits of their labor without exposing their food to harmful pesticides that many people try to avoid these days. Why Should More Of Us Compost? Composting is a natural process which reduces the amount of waste that we produce in our daily lives because all organic material can be composted and turned in to nutrient rich soil that can grow new life. One of the biggest problems that we have, particularly in the United States is that we produce so much waste that we are beginning to destroy the Earth. As we create more waste we are also destroying much of the natural soil that has taken thousands of years to build up and become balanced enough to grow life. By composting we are effectively giving back healthy and nutrient rich soil to the Earth. Rather than the soil that has taken thousands of years to build up to a healthy balance of nutrients, composting can provide nutrient rich soil in around five to ten years and helps to create a healthy layer of soil conducive to plant life. Composting has been around since the time of the early Romans in AD 50. However, in ancient times composters would let the organic matter sit for somewhere around a year before utilizing the compost itself. While allowing compost to sit for so long requires very little work on the part of the composter – since by the time the compost is needed it is fertile enough to be applied to the earth. It can also result in some drawbacks. Drawbacks of allowing compost to sit for as long as a year are generally the result of outside environmental factors influencing the compost, for example run off carrying pollution in to the compost heap or negative bacteria growing within the compost heap. It wasn’t until the 1920’s when composting became a tool used to help farmers farm organically and throughout the years since then composting has become a much faster process. Rather than allowing compost heaps to sit for long periods of time and become exposed to bacteria and run off which may pollute the compost and in turn pollute the food grown in the compost, modern-day composters have shortened the composting period so significantly that some even claim that they can produce fertile compost in just one month! In order for composting to be successful, compost must contain four ingredients that work together to maintain a healthy balance of nutrients within the compost. Carbon – The carbon serves to provide energy and the oxidation process of the carbon results in the heat that is often referred to in reference to compost piles. Materials that are high in carbon are generally dry, brown items such as dead leaves. Nitrogen – The nitrogen serves to allow organisms to grow and reproduce so that they can go to work oxidizing the carbon materials. Material that is high in nitrogen is usually green or colored and moist, such as fruit and vegetable waste. Oxygen – The oxygen serves to assist in the oxidation of the carbons and catalyze the decomposition process. Water – The water allows the compost to remain moist and maintain aerobic conditions so that the decomposition process can continue. The levels of these four ingredients differ based on the ratio formula used by the composter. While the ratio of the four elements listed above varies, the most efficient ratio for successful composting has a ratio of 30 units of carbon to 1 unit of nitrogen. When mixing compost the ideal ratio of carbon to nitrogen can generally be obtained by mixing together equal ratios of dry leaves and grass clippings. When the proper ratios of the above elements are present in compost micro-organisms are able to exist and begin to break down the matter within the compost heap to produce compost. When speaking of the micro-organisms at work in compost people are actually talking about a wide range of organisms including bacteria, actinomycetes, fungi, molds, yeast, protozoa and rotifers. The bacteria within the compost are the most numerous micro-organism found in any compost heap. The actinomycetes serve to break down paper products such as newspaper. The fungi, mold and yeast serve to break down items that bacteria are unable to break down. The protozoa are the cleanup crew and consume the bacteria, fungi and micro organic particulates that are produced in the composting heap. The rotifers are present to help limit the population of bacteria and smaller protozoa within the compost heap. Also frequently present in a compost heap are earthworms which are utilized to aerate compost heaps due to their tunneling activity. In addition to acting as an aeration system in the compost heap earthworms are also able to eat some of the partially composted material within the heap. 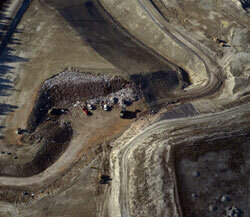 Many people ask why composting isn’t the same process as utilizing landfills to dump all of our waste. The fact is that landfills contain much more waste than items which decompose and form the delicate balance as is required by compost. In addition to the wide array of items that are jumbled together in a landfill, there is no control over the ratio of the main ingredients needed to compose fertile compost. Where individuals are able to regulate the ratio of the four main elements of compost in their much smaller compost heaps, landfills are so large that attempting to regulate ratios of ingredients would be absolutely impossible to do. How Do We Begin Composting? So, now that you understand the workings of compost as well as why you should be composting, how exactly do you go about composting? While many years ago people would begin composting by forming a pile of material in the bottom of the yard, these days’ people prefer to utilize composting bins. Composting bins are a particularly efficient way to compost because they allow you to mix composting materials as well as to keep the compost safe from runoff, rain and other bacteria that could otherwise contaminate compost left outside of a container. A composting bin also allows the odor of composting to be contained so that anyone can compost regardless of the proximity of their neighbors homes. Utilizing a composting bin ensures that virtually anyone can compost and by containing the gasses and heat of the compost pile in one enclosed area you are actually speeding up the composting process! Composting bins range in price from under $100 to over $200 depending on the attributes of the bin that you select. The more expensive bins generally have features which allow you to compost discretely cleanly and quickly. Read our full review of compost bins. After purchasing the composting bin that best suits your needs as well as your budget you will next want to introduce the ingredients to your compost pile or bin. The ingredients that you want to incorporate in to your mix are as discussed above: brown items, green items, air and water. By combining dead leaves, straw, hay, wood chips or wood shavings you will find your “brown” ingredients. By combining grass clippings, kitchen scraps, weeds and gardening waste you will find your “green” ingredients. Water will result as long as the mixture stays damp and air will come naturally. In order to maintain aeration throughout your compost pile you will want to turn the pile once in a while using a pitchfork. If you have a composting bin that allows for turning and features ventilation all you will need to do is turn your bin upside down once in a while to maintain a flow of oxygen throughout your composting bin. One concern that many people have when it comes to composting is the ratio of ingredients, many people find that their composting heap isn’t taking off the way they thought that it would however they are unsure why. 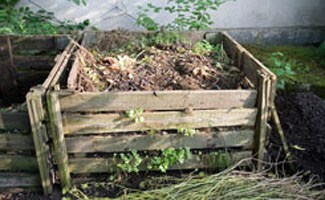 There are a few tips and tricks to understanding your compost heap and the process of composting as it relates to the ratio of ingredients that you use. If your compost heap does not begin heating up within the first day then your compost heap is in need of more green material to raise the temperature of your heap to encourage micro-organism activity. You should purchase a composting thermometer to keep an eye on the temperature of your compost heap because the temperature of your compost heap is one of the most important factors in maintaining a balance of micro-organism life. The center of your compost pile should be somewhere between 150 to 160 degrees Fahrenheit. If your compost pile has an offensive ammonia smell to it then your pile is in need of more brown material. The addition of more brown material to your compost heap will serve to moderate micro-organism activity within the pile and reduce the ammonia like smell of your compost heap. We put together this infographic to show a quick snapshot on how exactly the composting process works and why you should get started. Composting Really Is That Easy! The great thing about compost piles is that when they are improperly balanced there are fairly easy cues that will tip you off to the imbalance within the pile. Even better than having signs pointing to the fact that your composting mixture is not balanced, is that fixing any imbalance within your compost pile is extremely easy. To fix any imbalance all you need to do is add more of one of the two main ingredients within your composting heap to balance out the imbalance that is preventing your compost heap from being productive! The balance between brown and green within your composting pile is rather low maintenance as is maintaining an adequate level of moisture and aeration. At all times your compost pile should be moist but not wet and in order to keep your compost pile aerated you simply want to turn the pile frequently to add more oxygen to the pile. By adding oxygen you are increasing fuel for the aerobic activity which fuels composting and as such the more you aerate your compost pile the faster it will become fertile usable compost! Once in a while people find that they run in to issues such as complaining neighbors or frequent visits from neighborhood critters that are interested in the compost pile. The best and most efficient way to prevent both of these situations is to contain your compost pile in a secure composting bin. Composting bins reduce the odor that is emitted from a compost pile and they also serve to keep critters out of your compost pile. Another way to reduce interest in your pile by critters is to make sure that you do not throw dairy or animal products in to your kitchen waste that is going to be incorporated in to your compost pile. Dairy and animal products tend to draw the most attention from neighborhood critters and avoiding putting these items in to your composting heap will reduce the likelihood that critters will be interested in your compost pile. After your compost pile is adequately composted and is filled with rich nutrients it is time to put all of that hard work back to work! When using compost many people find it easier to filter their compost through a sieve type of apparatus to eliminate larger pieces of waste that have not yet been completely broken down. After filtering the larger pieces out of your compost pile your compost will be ready for application to your flower beds and vegetable gardens! Compost should be sprinkled over the area that you are interested in fertilizing. Many people use their compost to add to garden soil and increase its fertility, to use as mulch in flower beds or to act as a natural pesticide in their gardens! After using up your compost you can throw back any of the larger compost pieces that did not filter through your sieve or screen back in to your compost bin or compost pile. The larger pieces will add to your next compost pile as you begin the process all over again! Composting is a process which can be continued for as long as you like because the resulting fertile compost will always be desired by your flower beds and vegetable gardens and it is a great way to utilize your kitchen waste! Composting is just another way of recycling waste and reducing our impact on the planet while, at the same time, growing something great from something that we, at one time, deemed as waste! Composting is a relatively cheap process that everyone should be doing in order to do their part in giving back to the community. It is not much of a trade-off in consideration because it really is like getting something out of nothing! Do you compost or are considering it? I have a fairly good sized garden. I have no wish to put any chemicals on it and would prefer to use compost. I want to use my compost this year, not next year. So, I’ve been researching compost bins. And yes, my fear is that I won’t get the mixture right. I really enjoyed this article because it didn’t just tell me how to compost in general, but gave some vivid details as to the right mixture and temperatures. Since I plan to create a compost bin and use it on my garden this year, it’s vital that I get it right. To that end, thanks for all the great info. I’m going to make my compost bin from a large plastic tub. You know the kind that every mother has four or five of and can never seem to find the lids to? (That’s because she probably got them from other mothers who have no idea where the lid is.) At any rate, I’m going to drill holes in it that are equally spaced (by eye). This will help with the drainage. I don’t have a pitchfork, but I do have an old hoe and that’s what I plan to use to keep mixing it. A simple solution for a chemical free garden without the mess of a huge pile in the yard. I started keeping a compost bin in my backyard about five years ago and if everyone knew how easy it was to implement, I think a lot more people would do so. For that reason, I really like seeing articles like this on the web that help people realize how easy it can be and what kind of benefits they can achieve by doing so. I, for one, keep a small vegetable garden behind my house and with the compost that I have been able to produce, it has made my vegetable garden absolutely take off in terms of growth. The nutrient rich organic material mixes very easily with the soil and once I end up planting my seeds for the season, I usually see my vegetables sprout several days earlier than without using compost materials and the vegetables grow much bigger than with regular untreated soil. So I hope this motivates people to try it out for themselves. It is a great way to recycle your trash, keep things from ending up in a landfill, and help lessen our footprint on the Earth. The whole concept of compost has changed the way my son and I live. Just the other day I was amazed to learn how excited I am about gardening and composting. We started a compost bin this year and while it is not quite ready yet, I do enjoy going out to mess with it. I was just talking with my neighbor about it. He is quite a bit older than me and seemed to be the type of guy who would know a lot about gardening. I was totally shocked when he told me I cold use any of his compost that I wanted to. It seems that he got a big pile with the intention of putting in a garden, but then he got hurt and was unable to plant a garden for the year. All that compost was just sitting there waiting to be used. I never thought that I would so excited to be offered a pile of something like compost. Of all the things to get revved up about, that was not even on the list. But it is not just about being able to make my garden better. It is about better relations. Of course I am excited to be able to share what my garden produces and know that in a way, it was a small community effort. Since I started making my own compost, I have been introduced to a whole new world. I didn’t realize how much I was wasting before I started my compost project. In fact, I don’t want to even think about how much I have contributed to the current landfill problem. Even when I first started to make compost, I didn’t realize all that could go into it. For a while all I would put in the compost pile was organic scraps from the kitchen. Then I read about all the things that I could put in the compost and realized I was still wasting far more than I needed to. And the person who really noticed the difference was my son. He takes the waste out to the compost every day because we keep it in a small container that we empty daily, regardless of how little is in it. After about a week of emptying the container after I learned about all the things I could compost with, my son realized he had yet to take out a bag of garbage to the trash. That is a pretty significant change for us. We used to take it out at least a couple of times a week! I’m still learning and it is articles like these that makes the experience so pleasant. I just started composting this year. I truly love it. I feel like I am doing something good for not just my family, but for the environment as well. I am even enjoying just going out there and seeing all the little bugs in there. It’s amazing how many different life forms benefit from one small compost bin. It’s also teaching my son about recycling and how the cycle of life operates. He is a natural scientist who always questions everything and wants to know all about animals and how they work within an ecosystem. In fact, it’s a topic he brings up on a regular basis, usually before I’ve finished my first cup of coffee. So, all is well with our compost, with the exception that everyone around me is kind of angry about it. I didn’t expect that at all. Yes, I am a little odd and used to people noticing that. I’m just not used to the anger over it. People go so far as to try to sneak in chemical fertilizer or make fun of my compost. They keep trying to convince me that I have to add some chemicals to my garden for anything to grow. The funny thing is, my plants are growing just fine on their own. I think I’ll keep trusting in Mother Nature to lead the way. We started a compost bin this year and I can’t even tell you all the benefits we’ve had so far and we haven’t even gotten to use the compost yet! But, we do save so much in the way of getting rid of our trash, that the savings in trash bags and disposal service alone are well worth the compost effort. It’s also gotten my son more interested in science. He is in charge of stirring the compost right now because we don’t have a ton of it in there and he is still able to turn it. When the bin gets fuller, he might not be able to. But, doing the chore itself is a good experience for him. It also makes him feel cool when he gets to explain to his friends how we are recycling just about everything we use. Most of them live in town and don’t really have any experience with gardening or anything like that. They seem to enjoy learning about all the things that can be used to help the garden. We hope to be able to use the compost in the garden next year, if not sooner. Hopefully my son will be just as interested in it then as he is now, but if not, I’ll take what I can get at the moment. If nothing else, at least I get to pass along some useful knowledge to him. Hopefully he will do the same for his family. The author seems to actually be speaking directly to me about the topic of home composting. To be honest I had heard the word before, but I think I was a bit unclear about exactly what it was. I remember when my mom went on a composting kick back in the 70’s, but only vaguely. I seem to recall that we started saving almost everything including coffee grounds, banana peels and even egg shells. It all went a strange container that had a weird smell to it! Of course, I was very young at the time so I do not remember. The article actually brought back a number of good memories. I remember now that bin was actually called a composting bin and the whole idea was that the organic material would decompose and serve to create incredibly mineral rich soil. Simply spreading it on land has a number of benefits. It can really help to make crops and even flowers and other plants grow. This a great way to use natural methods. Whether you are growing a home garden for flowers, vegetables or herbs, using compost can help you very much. This article really made me think more closely about composting. I was familiar with the concept, although it is something I have never actually tried. I suppose that this would be a great way to develop some truly natural fertilizer, rather than having to rely on commercial brands with all of their chemicals and additives. After reading the article I also think that this could be a good way to help naturally re balance the nutrients in the soil. It seems that all of the farming and other methods we use has served to leech many of the natural components and nutrients from our soil. It seems to me that this could also be a big help to farmers, although I wonder how much work it would take to create enough compost to supply an entire farm. The author pointed out that composting is a time honored tradition which dates back at least to the early Romans. Personally, I think that this is a method which has been in use for centuries before the Romans, possibly going even as far back as the earliest humans. There are so many benefits to composting that I can’t even begin to list them all. You can even compost your own body waste if you use the right toilets! I haven’t taken it quite to that level yet, but I do know it can be done. The only danger is that sometimes people put things in their compost that actually isn’t good for it, but they don’t realize it. They might throw things like cereal boxes in their compost, thinking that they are doing the right thing because they are putting cardboard in there. What they don’t realize is that they are also putting chemicals in the form of glues and dyes in their compost. Really, the best thing to do is go completely organic. Then you can put just about anything in your compost and be worry free about it. However, this can be an expensive process for the first year or two until you build up enough of a garden to be able to create your own organic foods for the entire year. Start gradually and be smart about what you put in your compost pile. Even if you end up giving up on the process, you’ll find that you have saved money in the form of trash bags! My sister has been home composting now for almost fifteen years. She lives in the city of Chicago in a very densely populated area and manages to do so without stinking up her own living space. It does require a bit of extra effort on her part sorting out her organic trash from the inorganic matter before it goes in the compost container, but the benefits she sees from doing so and the enjoyment she gets from knowing the good that she is doing goes a long way toward making it all worthwhile. I wholeheartedly believe in the benefits of composting and I think as a society, we are really all better off if we make some kind of use out of our waste. In the United States, we probably waste more than any other country on a per-person basis. If just half of the citizens in this country would take on an activity like composting, the end result could be phenomenal. I love seeing articles like this that make the activity of composting, or any recycling program or method of making your home or life more efficient seem so easy. In reality, these things are easy. The difficult part is making it a habit and integral part of your everyday life. People generally do not like to make any changes outside of the bare essential parts of their routine. If you can sell people on how it can be done and can be done without much commitment on their own part, then you can really get a good deal of participation and cooperation that is ultimately necessary to making something matter. The other day I was out for a cup of coffee. I was sitting next to a friend of mine who is in her early 20’s. The place we were sitting is maybe 100 yards away from the feed mill here in town. This area is devoted to farming. So, imagine my shock when I started talking about my compost bin at home and she had no idea what I was talking about. Literally. She did not know what compost was and she was socked to learn that you make it yourself. I seriously had to talk her through each and every step of the compost process. Now, if someone who lives in an area that is all about farming has no idea that there is such a thing as compost, what does that say for the rest of the world. I mean, these are the same people who are shocked when the city kids think that beef comes from the grocery store rather than from any kind of animal. Why is this not common knowledge? Isn’t this something that our schools and parents should be teaching kids about? These children can hack into websites and write HTML better than they can do cursive. But that don’t know what compost is.That is just scary.